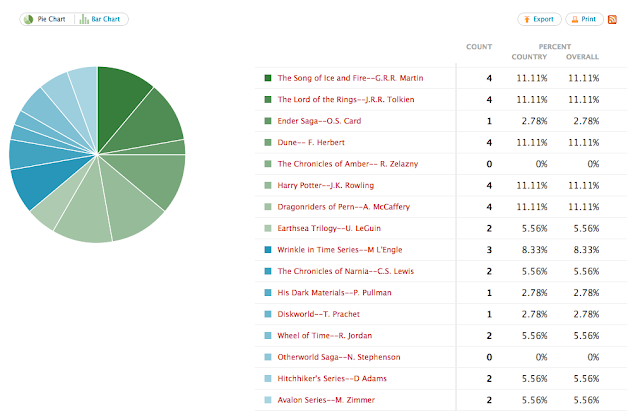 The Results of The Best SciFi/Fantasy Series Poll are now up. However there were SO many write in suggestions that I'll be running another "semi-finals" poll in December (that will go up on Tuesday). Be sure to vote on that one too. The best performers on that and this poll will go on to a finals round in January. Just FYI, I didn't vote in this poll 'cause I couldn't figure out how to get it to show up on my phone. Don't know if that's anything you can do anything about for next time or not. I don't know how to do that. It seems like none of the widgets really work on the mobile version. Haven't you already read three of those? More than that. This is mostly just an opinion poll. All votes for Wheel of Time should go to LOTR. Same difference. I also don't really enjoy the fact that Book 1 was one giant prologue.